Please take a few minutes to "Like" our page! This book helps you respond to High-Conflict People - or anyone - who engages you with hostile emails, vicious rumors or just plain difficult behavior. Learn how to keep it Brief, Informative, Friendly & Firm. Such personal attacks are not about you. Personal attacks are about the inability of the other person to manage their own emotions and behavior, and their inability to solve problems. I call such people “high-conflict people” (HCPs), because they lack skills for dealing with conflict. Instead of sharing responsibility for solving problems, they increase conflict by making it intensely personal. They are the most difficult people, because they repeatedly focus on what I call a “target of blame” possibly you! They speak Blamespeak. Attack, defend, and attack again. I wrote this book to help you respond to HCPs – or anyone – who engages you with hostile emails, vicious rumors or just plain difficult behavior. 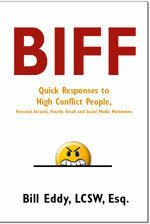 But before I explain how to write a BIFF Response, I want to give you a brief understanding about high-conflict people (HCPs). To deal with them successfully requires a shift in how you think about them, so that you know what not to do, as well as what to do.